Spending on mobile ads is expected to reach $1.23 billion this year, according to a revised estimate from eMarketer, which represents a 65 percent increase from 2010. The estimate is slightly up from the $1.1 billion number eMarketer put out a year ago. These numbers include display, search, text ads, and even video ads (which are the fastest growing mobile ad unit). Mobile video ads are expected to generate $57.6 million this year, and grow at a 69 percent compound annual rate through 2015, when they are estimated to reach $395.6 million. Next year, mobile display and mobile search will be about even thanks to the growth in app advertising. 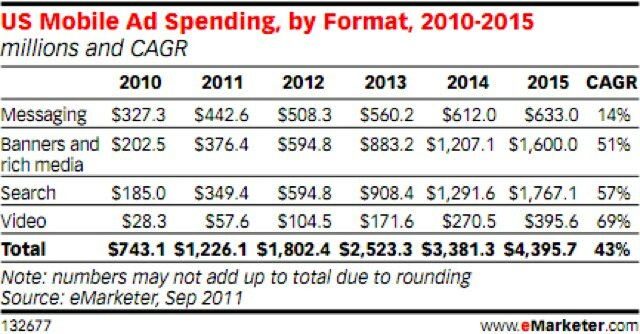 Each will represent almost $600 million in ad spending in 2012.